Info "‘Hey, weakling! This is how I train every day. You could learn a little something, <player’s name>!’"
Sucker Punch is one of Tiny Wario's Microgames in WarioWare: Smooth Moves. 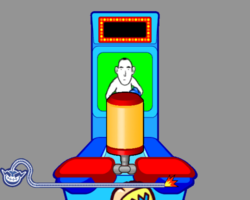 The player must punch the target by aiming with the Wii Remote. 1st level difficulty: The target is directly in front. 2nd level difficulty: The target is above, so the player has to raise the Wii Remote up to do an uppercut. 3rd level difficulty: The target is moving left to right. This page was last edited on February 20, 2018, at 17:34.